The MTV Movie Award for Best Fight is an award presented to actors and characters for quality fight scenes in films at the MTV Movie Awards, a ceremony established in 1992. Honors in several categories are awarded by MTV at the annual ceremonies, and are chosen by public vote. The MTV Movie Award for Best Fight was first presented in 1996 to Adam Sandler and Bob Barker for their fight in Happy Gilmore. Uma Thurman won the award in 2004 and 2005 for her fights against Chiaki Kuriyama and Daryl Hannah in Kill Bill: Volume 1 and Volume 2, respectively. In 2008 and 2009 Cam Gigandet was presented with the honor for his fights in Never Back Down and Twilight. 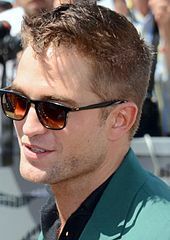 Robert Pattinson has also won the award twice, for his appearances in The Twilight Saga films: Twilight in 2009 and The Twilight Saga: Eclipse in 2011. Jackie Chan has won the Best Fight honor once from four nominations. Jet Li and Chris Tucker have each received three nominations, and Brad Pitt and Hugh Jackman have each been nominated twice. The fight between Angelina Jolie (left) and Brad Pitt in Mr. & Mrs. Smith won the 2006 award. 2014 winners Orlando Bloom and Evangeline Lilly. Jim Brown vs. a Martian– Mars Attacks! ^ "1992 MTV Movie Awards". MTV (MTV Networks). Retrieved July 25, 2011. ^ Ditzian, Eric (March 22, 2011). "2011 MTV Movie Awards Voting Begins Today!". MTV News. MTV Networks. Retrieved July 25, 2011. ^ "Winners By Category". MTV (MTV Networks). Retrieved July 25, 2011. Note: Click on the 'Best Fight' section. ^ "1996 MTV Movie Awards". MTV (MTV Networks). Retrieved July 25, 2011. Note: Click on the 'Winners' tab. ^ "1997 MTV Movie Awards". MTV (MTV Networks). Retrieved July 25, 2011. Note: Click on the 'Winners' tab. ^ "1998 MTV Movie Awards". MTV (MTV Networks). Retrieved July 25, 2011. Note: Click on the 'Winners' tab. ^ "1999 MTV Movie Awards". MTV (MTV Networks). Retrieved July 25, 2011. Note: Click on the 'Winners' tab. ^ "2000 MTV Movie Awards". MTV (MTV Networks). Retrieved July 25, 2011. Note: Click on the 'Winners' tab. ^ "2001 MTV Movie Awards". MTV (MTV Networks). Retrieved July 25, 2011. Note: Click on the 'Winners' tab. ^ "2002 MTV Movie Awards". MTV (MTV Networks). Retrieved July 25, 2011. Note: Click on the 'Winners' tab. ^ "2003 MTV Movie Awards". MTV (MTV Networks). Retrieved July 25, 2011. Note: Click on the 'Winners' tab. ^ "2004 MTV Movie Awards". MTV (MTV Networks). Retrieved July 25, 2011. Note: Click on the 'Winners' tab. ^ "2005 MTV Movie Awards". MTV (MTV Networks). Retrieved July 25, 2011. Note: Click on the 'Winners' tab. ^ "2006 MTV Movie Awards". MTV (MTV Networks). Retrieved July 25, 2011. Note: Click on the 'Winners' tab. ^ "2007 MTV Movie Awards". MTV (MTV Networks). Archived from the original on August 8, 2010. Retrieved July 25, 2011. Note: Click on the 'Winners' tab. ^ "2008 MTV Movie Awards". MTV (MTV Networks). Retrieved July 25, 2011. Note: Click on the 'Winners' tab. ^ "2009 MTV Movie Awards". MTV (MTV Networks). Retrieved July 25, 2011. Note: Click on the 'Winners' tab. ^ Wigler, Josh (June 6, 2010). "2010 MTV Movie Awards: Complete Winners List". MTV News. MTV Networks. Retrieved July 25, 2011. ^ "Reese Witherspoon Picks Up MTV Generation Award". MTV News. MTV Networks. June 6, 2011. Retrieved July 25, 2011. ^ "2012 MTV Movie Awards". MTV (MTV Networks). Retrieved August 16, 2013. Note: Click on 'Winners' tab. ^ "Best Fight". MTV (MTV Networks). Retrieved August 16, 2013. Note: Click on 'Winners' tab. ^ "Best Fight". MTV (MTV Networks). Retrieved March 10, 2016. Note: Click on 'Winners' tab.